James D. Julia’s Can’t Miss Late Fall Auction to Present a Phenomenal Selection of Museum-Quality Rare Lamps, Glass, Decorative Arts, and Fine Jewelry. This highly anticipated, $3+ million dollar auction features over 750 lots of gorgeous, highly sought after merchandise, just in time for the holiday shopping season. 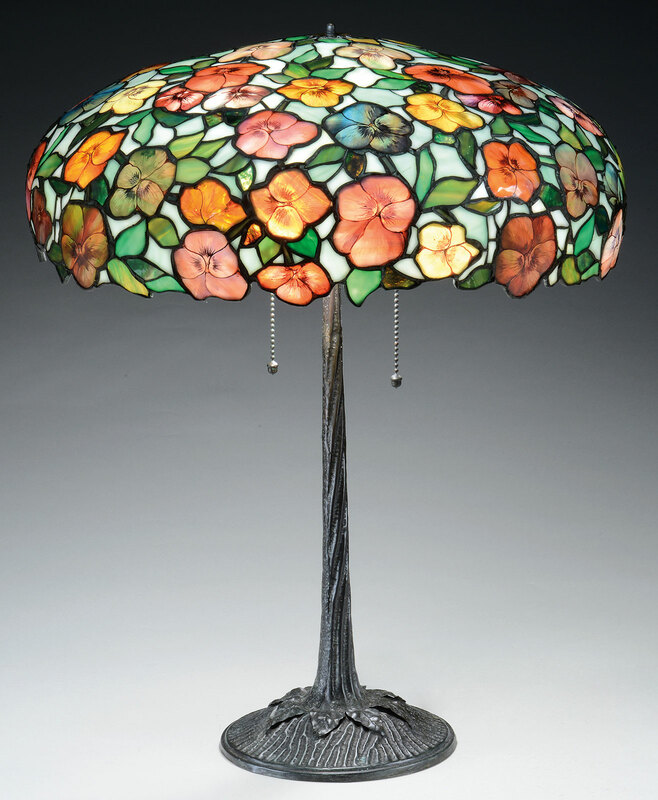 Tiffany Studios Rose And Butterfly Table Lamp, estimated at $65,000-80,000. James D. Julia, Inc. is excited to announce its annual late fall Lamps, Glass & Fine Jewelry auction to be held on December 1, 2017. This auction includes highly vetted examples from brands including Tiffany, Daum Nancy, Lalique, Galle, Handel and Amphora, among many others. The auction starts promptly at 10:00 a.m. at the company’s Fairfield, Maine gallery. Preview will be held November 30th from 8:00 a.m. to 5:00 p.m., or by special appointment. This can’t miss event includes many unreserved, new to the market collections, providing enthusiasts tremendous opportunities at every price point. James D. Julia, Inc. enjoys a well deserved, world class reputation for leadership in the fine antique lamps and lighting categories. There is no question that collectors will be turned on with this auction’s remarkable offerings of important leaded and hand painted examples. Over 60 lots of Tiffany fixtures are available - including outstanding table lamps, floor lamps, and chandeliers. Lot 1473, a highly desirable and petitely proportioned Tiffany Studios Rose and Butterfly table lamp, is truly a work of art. Its 16” shade is decorated with yellow roses and striated yellow and red butterflies within a mottled blue and white opalescent honeycomb background. It sits upon a 22” bronze urn base resting within a five legged bronze stand. Both the shade and base are signed. This absolute rarity, the first one ever handled by Julia’s experts, is estimated at $65,000-80,000. 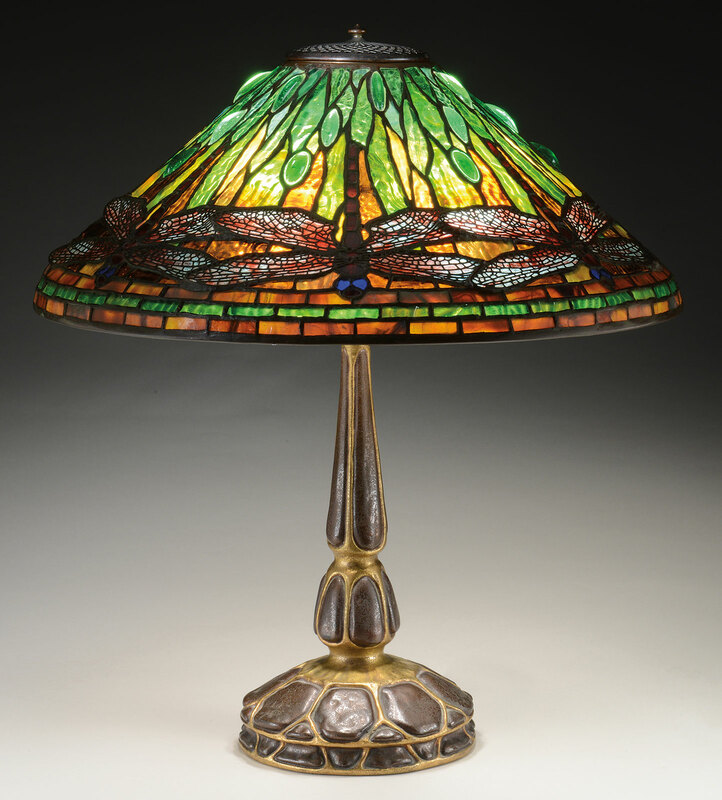 Also certain to cause a buzz is lot 1462, a Tiffany Studios Dragonfly table lamp, estimated at $60,000-80,000. Its shade is decorated with dragonflies with striated red and cream colored wings with deep red bodies and blue eyes; they are set against a textured, striated green and amber background giving way to bright amber at the bottom. 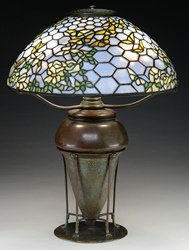 The shade is further decorated with oval green cabochons and rests on a Tiffany Studios faux turtleback bronze base. Both the shade and base of this simply magnificent example are signed. This auction features fine antique lighting from other top-tier American and European brands, including Buffalo Studios, Suess, and Bigelow and Kennard. Lamps by Handel are collectors’ favorites for good reason - they are the best of functional design and hand painted expertise. This auction offers over 20 quality Handel examples, with an exceptional one being lot 1616, a Handel Mountain Stream table lamp. 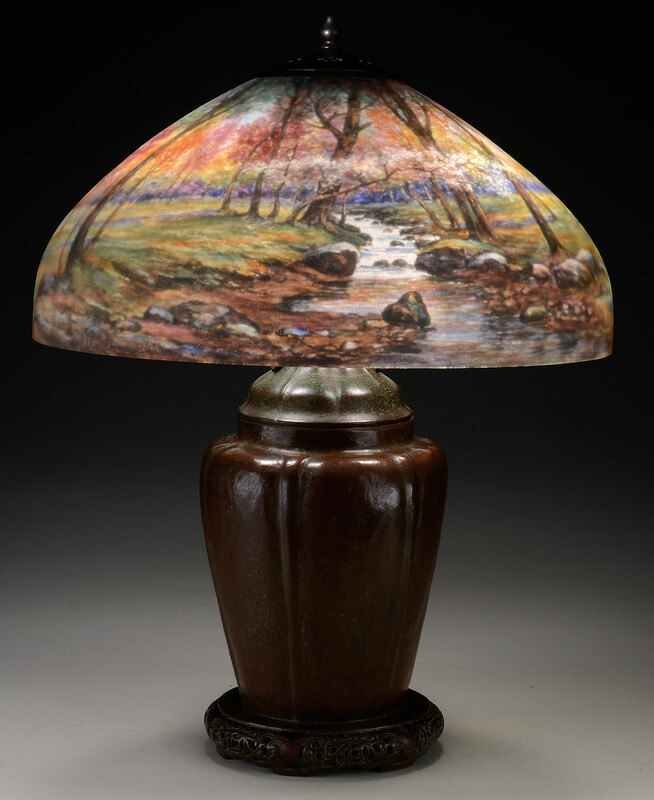 Estimated at $20,000-30,000, this lamp features a reverse painted, ribbed shade decorated with a mountain stream winding its way through peaceful woods. It rests on a Handel canister base; both the shade and the based are signed. This truly eyecatching example is almost identical to the one shown in DeFalco, Hibel, and Hibel’s Handel Lamps, page 63. Also featuring natural themes is lot 1653, a John Morgan and Sons Pansy table lamp, estimated at $18,500-22,500. This example blossoms with its leaded glass shade covered with colorful pansies against a striated green and white background. Each pansy has hand enameled detail, giving a very realistic appearance to the flowers. Cameo style art glass makes a colorful showing in this auction, with examples demonstrating the finest intricate hand work taking center stage. Lot 1088, a Galle marquetry Nenuphars vase, is beautifully decorated with inlaid pink, green, and white water lilies with green lily pads surrounding the vase; some of the inlaid leaves and lily pads are also wheel carved. This breathtakingly beautiful example, estimated at $60,000-80,000, is engraved "Galle" and has provenance to Impulsion B- Paris 2004. Another can’t-miss Galle highlight would be lot 1095, a large Galle mold blown Plum vase, executed in the unusual color combination of green and yellow leaves and fruit against a salmon background. Signed "Galle,” this rarity is estimated at $20,000-25,000. For Daum enthusiasts, all eyes are certain to be on lot 1010, a Corbeau et Grenouille cameo vase decorated with a raven, tree branches, cameo flowers, and a frog set against a mottled, shaded background, and lot 1007, a cameo and enameled Broken Egg vase decorated with a scene of trees along a pond's edge. Both are signed "Daum Nancy" with the Cross of Lorraine, and are estimated at $15,000-20,000 and $6,500-8,000 respectively. Also making cameo appearances are fantastic examples from less prominent manufacturers. Let’s raise a glass to lot 1178, a Schneider wheel carved Grape vase, estimated at $7,000-10,000. This handsome example is detailed with bunches of applied black grapes which are flameworked and wheel carved. It is marked with the engraved signature "Schneider.” This exact vase is illustrated in Joulin and Maier’s Charles Schneider on page 280, and has provenance to the Roy and Susan Bittan Collection. Roy has been a member of Bruce Springsteen's E Street Band since 1974. And three’s a charm with lot 1267, a marked Thos. 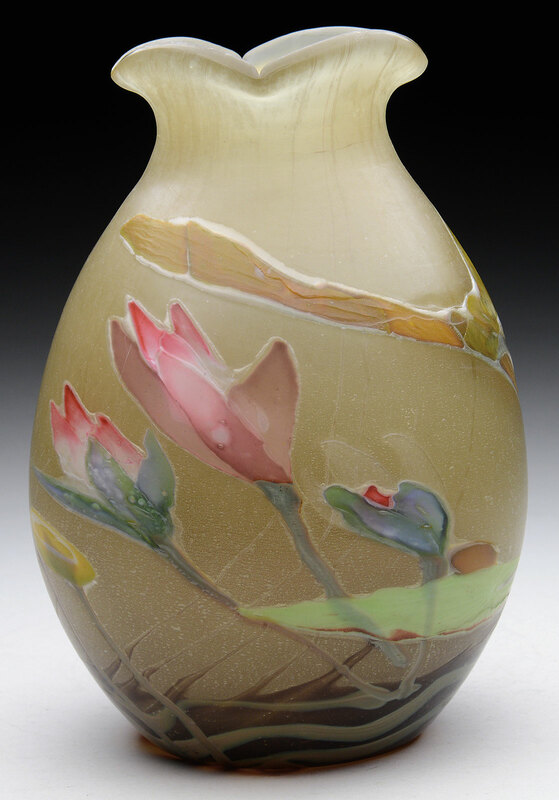 Webb & Sons white, red, and yellow cameo vase decorated with flowers, leaves, and butterflies, estimated at $2,000-3,000. It’s easy to say “oui” to this auction’s marvelous selections of other distinctively decorated French vases. 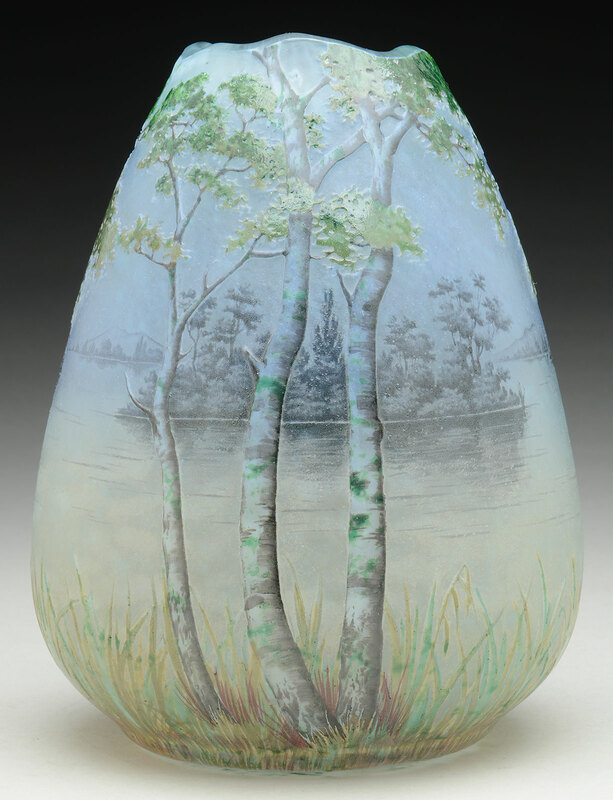 Lot 1143, an extraordinary G. Argy Rousseau pate de verre Garden of Hesperides vase, is estimated at $25,000-35,000. This vase is decorated with a repeated scene of an evening nymph guarding the apple trees of Hera's garden following her marriage to Zeus. The maidens are executed in bright fuchsia, under the red apples of the trees with dark violet branches and trunks, all over a stylized Greek-key bottom border. It is signed "G Argy-Rousseau" on side of vase and "France" on the underside. This pretty-in-pink treasure has provenance including The Elton John Collection, Sotheby's London 1988; Christie's New York, 1998; and a prominent Midwest collection. Similar examples are illustrated on the front cover and pages 72-73 of J. Bloch-Dermant’s G. Argy-Rousseau, Glassware as Art. Lot 1226, a rich amber R. Lalique Perruches vase decorated all over with parakeet pairs resting on tree limbs, is estimated at $10,000-15,000. It is marked with the engraved script signature "R. Lalique.” And lot 1221, a Camille Faure enameled vase, blooms with enameled chrysanthemums in magenta, red, orange, and yellow with green and magenta leaves set against a multicolored background. This exquisite piece of decorative art is from the Liza Feldman collection and is signed "C. Faure-Limoges.” This exact example is featured in A. Shayo’s book Camille Faure, page 85, and is estimated at $7,000-9,000. Fine porcelain and pottery are also important categories in this late fall auction, with over 60 fine temptations on offer. The Austrian Art Nouveau Amphora genre has a huge following, given its distinctive themes, remarkable presentation, and unmistakable quality. Lot 1237, an Eastern Dragon vase, is decorated with a highly detailed beast and finished in a shaded tan and dark green glaze. It is signed with an impressed “AMPHORA AUSTRIA,” “TURN,” “PARIS 1900,” “4105,” and the artist mark “EST 99″ for Eduard Stellmacher. What makes this so extraordinary is that its markings reveal it was made in 1899 specifically for the 1900 Paris Exhibition. This celebration-worthy example is estimated at $6,000-9,000. And lot 1283, a Wedgwood Fairyland Lustre Goblin Vase, is also fantastical. It is decorated with brown goblins sporting blue wings; the sprites are standing at the orange water's edge on green grass. It is marked on the bottom with the Portland vase mark and “Wedgwood Made in England” and is estimated at $7,000-10,000. This comprehensive auction rounds out with highly curated offerings of decorative desk and metal accessories, modern glassworks, precious jewelry, and other fine antiques. 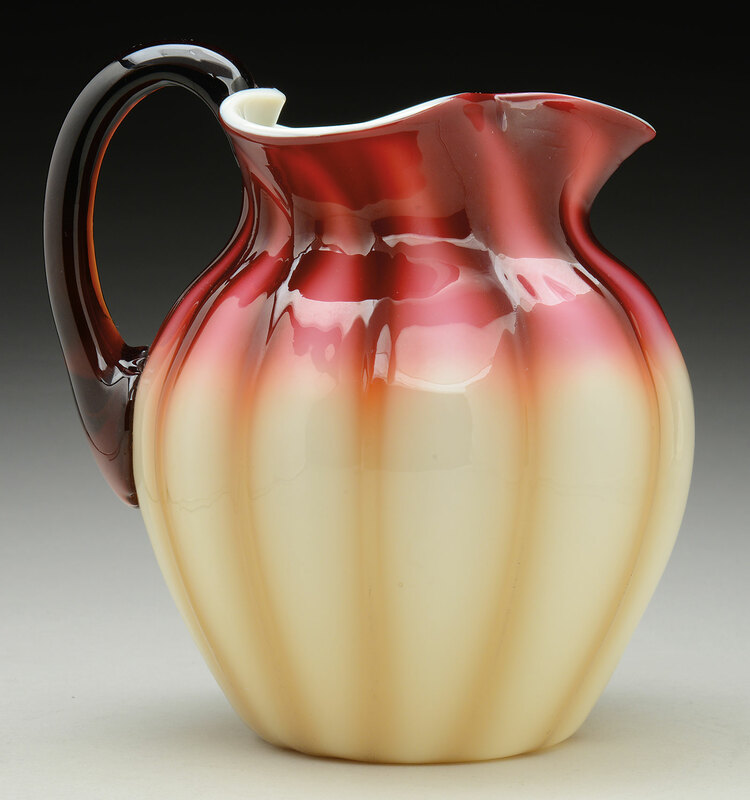 Collectors will pour over lot 1724, a 7” plated Amberina pitcher. This choice example features a nice color gradation from fuchsia at the top to amber at the bottom and is estimated at $3,500-4,000. 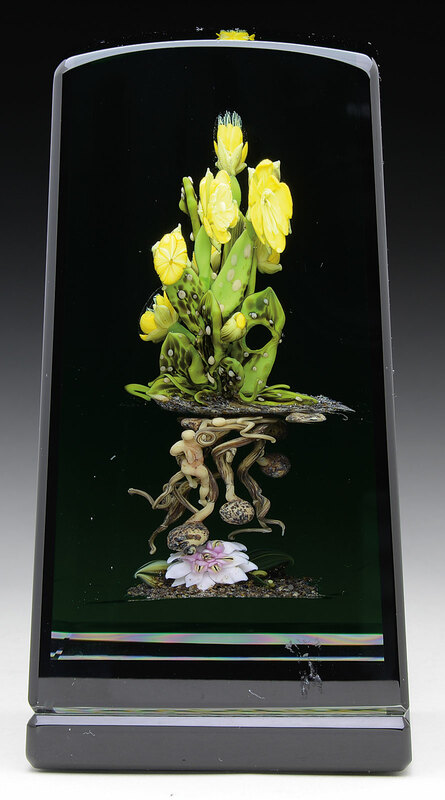 Lot 1319, a Paul Stankard cloistered glass botanical sculpture featuring a prickly pear cactus, yellow flowers, green leaves, and his signature "spirits under the earth" is estimated at $7,000-9,000. 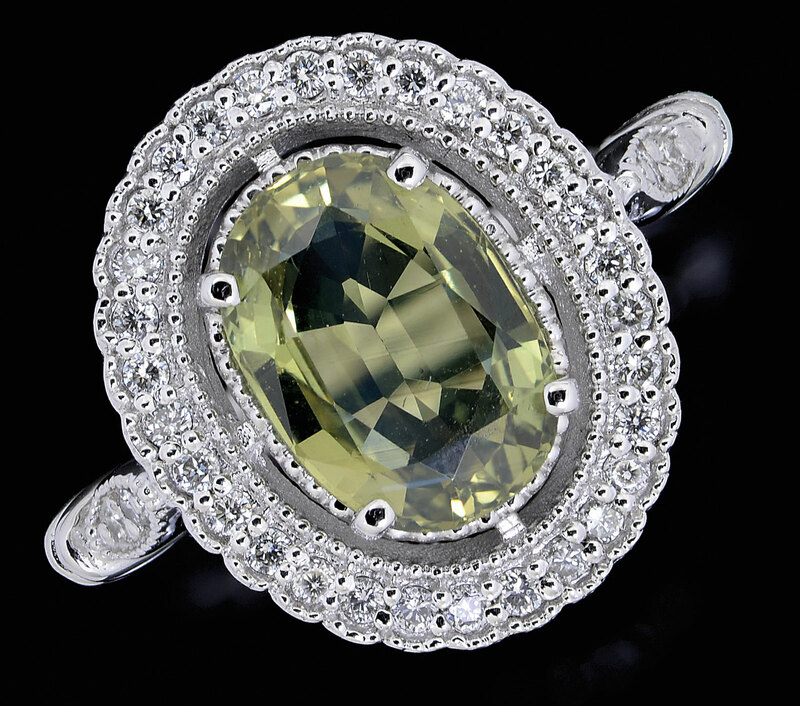 And lot 1396, a 14kt white gold ring featuring a 2.87 cttw Chrysoberyl gemstone and a diamond halo is estimated at $2,500-3,500. It would indeed be a heavenly choice for that angel on your holiday gift list this year! In addition, there are nearly 100 lots of fine jewelry from private estates being sold completely without reserve. Be sure to check out all the lots in this Rare Lamps, Glass & Fine Jewelry auction at http://www.jamesdjulia.com - where you can now securely, quickly, and easily electronically place your auction bids directly from our website! James D. Julia, located in Fairfield, ME and Woburn, MA. 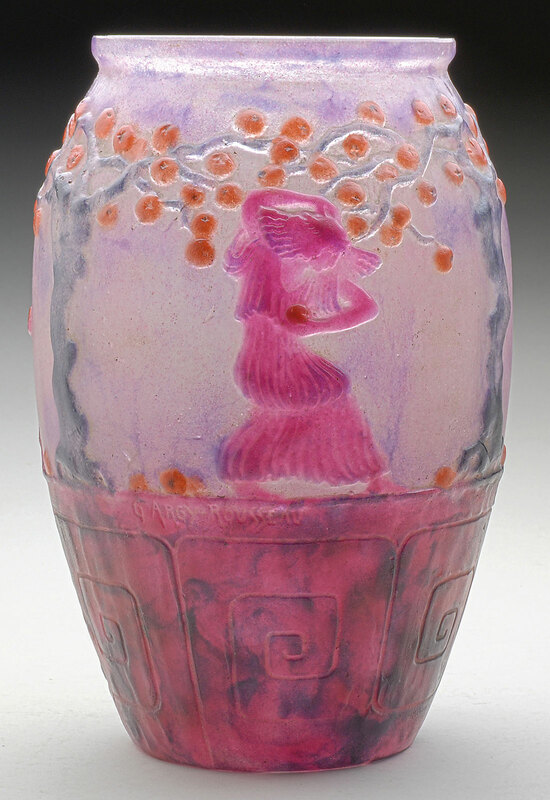 Daum Cameo And Enameled Broken Egg Vase, estimated at $6,500-8,000. 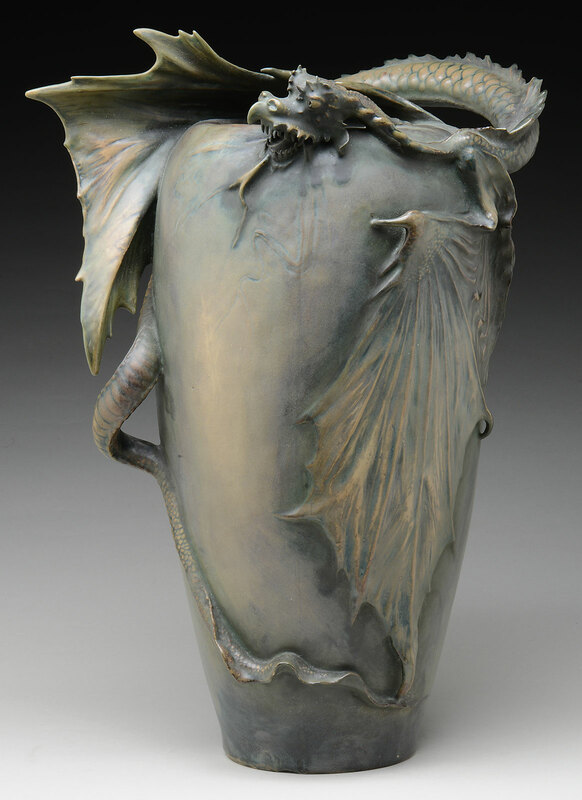 Daum Nancy Corbeau Et Grenouille Vase, estimated at $15,000-20,000. Galle Marquetry Nenuphars Vase, estimated at $60,000-80,000. 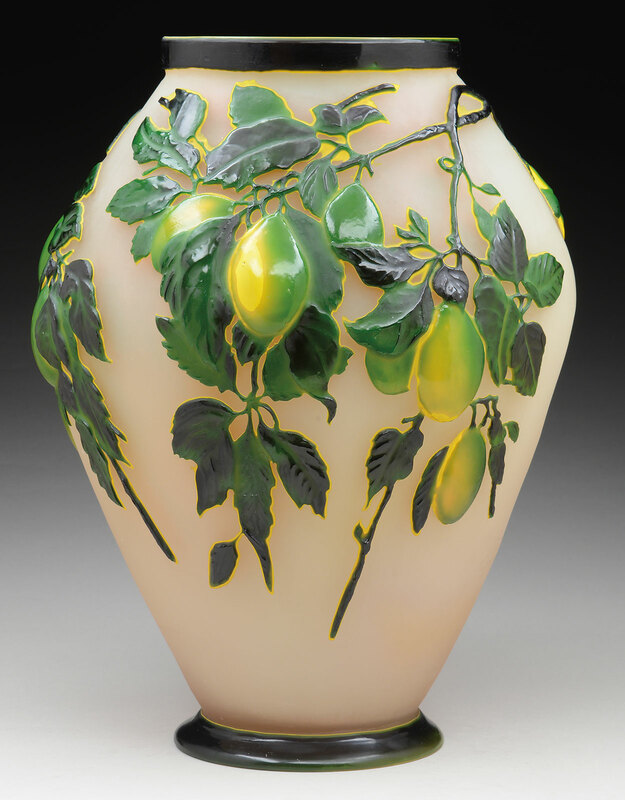 Galle Mold Blown Plum Vase, estimated at $20,000-25,000. G. Argy Rousseau Garden Of Hesperides Vase, estimated at $25,000-35,000. 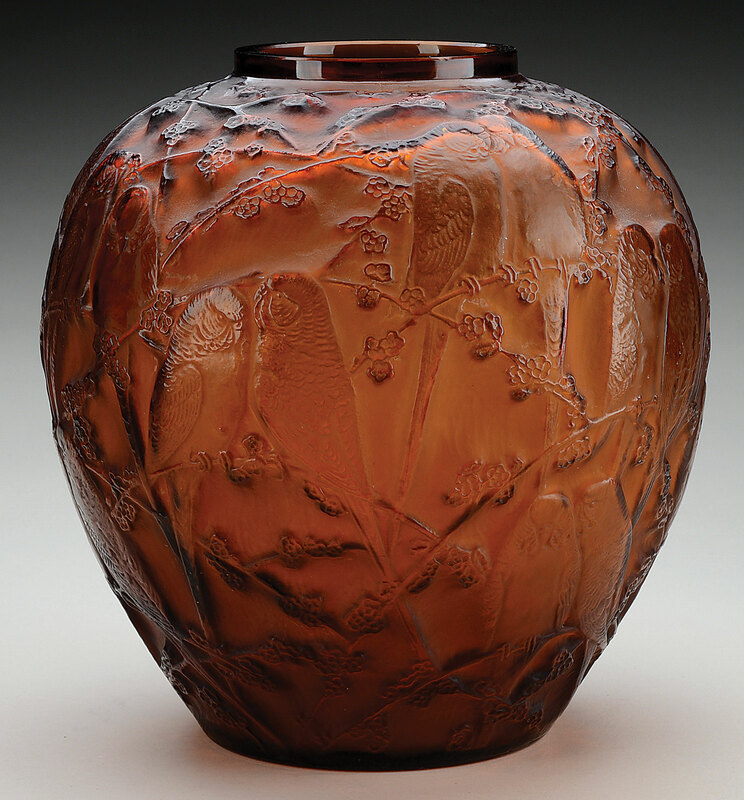 Schneider Wheel Carved Grape Vase, estimated at $7,000-10,000. 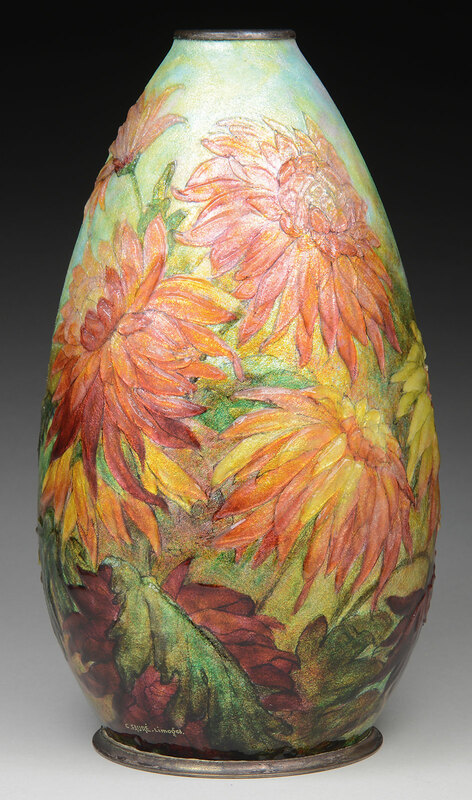 Camille Faure Enameled Vase, estimated at $7,000-9,000. R Lalique Perruches Vase, estimated at $10,000-15,000. Amphora Eastern Dragon Vase, estimated at $6,000-9,000. 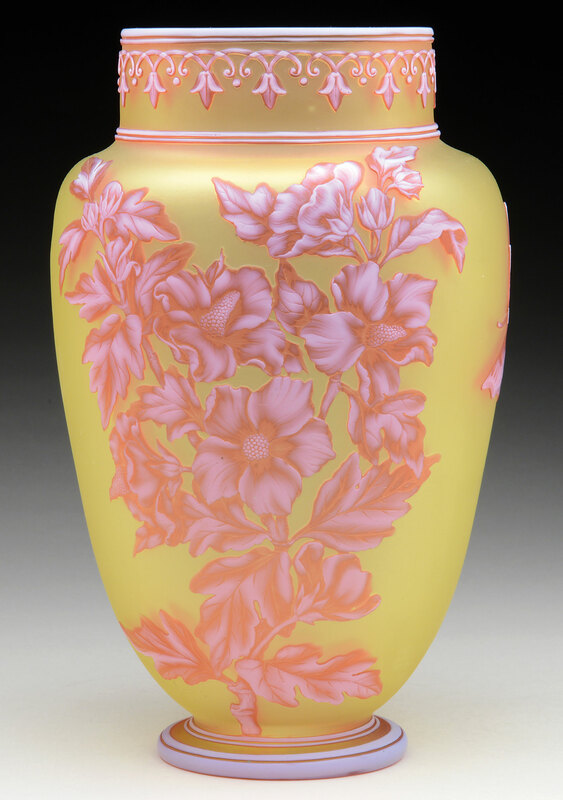 Webb Three Color Cameo Vase, estimated at $2,000-3,000. 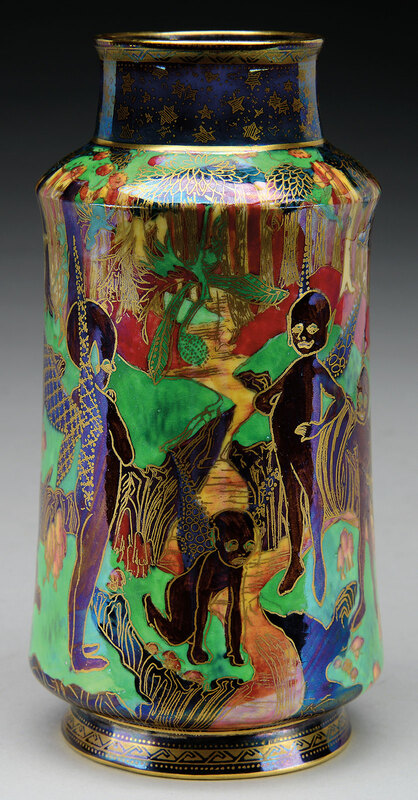 Wedgwood Fairyland Lustre Goblin Vase, estimated at $7,000-10,000. Paul Stankard Botanical Sculpture, estimated at $7,000-9,000. 14kt Gold, Chrysoberyl, And Diamond Ring, estimated at $2,500-3,500. Tiffany Studios Dragonfly Table Lamp, estimated at $60,000-80,000. Handel Mountain Stream Table Lamp, estimated at $20,000-30,000. Morgan Pansy Table Lamp, estimated at $18,500-22,500. Plated Amberina Pitcher, estimated at $3,500-4,000.